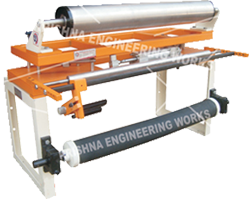 Rewind Trolley with Web Guiding System manufacturer, Rewinder Trolley are generally used for all Roll form application where one end is Unwinder and the other end is Rewinder. In between any type of converting process for flexible film, paper, cloth, fabric is being processed. We Are manufacture Web Aligner System Rewinder Trolley with Tracking Web Aligner System that can be fitted into any type of Machine. The Rewinder Trolley is heavy duty which can handle any type of Roll Load, Weight and precision. Rewind Trolley with Web Guiding System for Slitter Rewinder Machine, Unwinder Rewinder and many more.